Here is a quick recipe forÂ aÂ good sandwich for big gatherings, it should not take you a long time to prepare andÂ itÂ requires a very small number of ingredients.Â BB, or Black Beautify, is a reference to the balsamic vinegar and Worcestershire sauce Â used in it. Wash the chicken cubes and then drain them well. Put the chicken cubes in a bowl, add the Worcestershire sauce, the salt and finely crushed black pepper. Mix the chicken with the ingredients well and leave the bowl in the fridge to marinate for 30 minutes minimum. You. Then take them out of the fridge 15 minutes before you use them. Put a frying pan on a medium flame, add the EVOO and the garlic to it, then as soon as the oil starts to sizzle, add the chicken. SautÃ© the chicken until it turns white and then add the balsamic vinegar. Keep sautÃ©ing the chicken until it is done. If the chicken is still not cocked well you can add small amounts of water or chicken stock to help cook it. Slice the buns and fill them with the chicken. You can add cheese or any kind of sauce you like. It can be served with chips or fries. This recipe is simple easy way for makingÂ a very tasty chicken grilled in the oven. It takes 10 minutes of spices preparation and around an hour of grilling without the need to check it. I consider it a healthy meal as itdoesnâ€™t require any oil for cooking and contains a couple of herbs and spices which are rich with helpful minerals. Rub the green chili, garlic, black pepper, turmeric, and salt allÂ over the chicken. Fill the inside of the chicken with the chopped onion, tomatoes, and coriander. Squeeze the lemons on the outside and inside of the chicken. Wrap the whole chicken with aluminum foil and put it on an oven tray. If you are using a gas oven switch the down flame at medium to high heat. If using an electric oven use 260â€˜C. Optional vegetables could be grilled next to the chicken, but make sure you wrap it with aluminum foil otherwise it will burn for that long. The chicken could be either eaten with rice or bread. 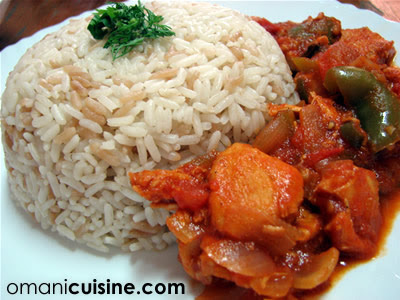 If rice is used its advised to have some sort of curry such as Dal (lentils) as the chicken wouldnâ€™t be very saucy even though the tomatoes is inside it. This post is dedicated to one of our favourite English teachers, the one and only, Mr Don Yager. We invited him over to the Omani Cuisine during his visit to Oman this year, he retired three years ago and now lives in Iowa, USA. Chicken 900 is a chicken steak served in an American style with three side dishes, namely, mashed potatoes, garlic bread, and honey green salad. Named Chicken 900 after the legendary English 900 book. Crush the garlic cloves, add half of the black pepper, honey, vinegar, tomato paste, and Worcestershire sauce, mix them well and then put the combination in the fridge for half an hour to allow the flavour to blend. Season the chicken breast with salt and the remaining crushed pepper. Heat a frying pan and drizzle some EVOO. When the pan is screamingly hot place the breasts on it. Get the mix from the fridge and wait for one of the sides of the chicken breast to whiten in colour, when that happens, flip the chicken breast and brush that with the mix. Wait for the other side to whiten, then flip and brush. Repeat the process until the mix finishes. Add water to the pan, wait for the water to evaporate, then check if the chicken is cooked using the knife test. Repeat this stage until the chicken is cooked. Serve with mashed potatoes, garlic bread, and salad. You can optionally fry slices of zucchini along with the chicken. 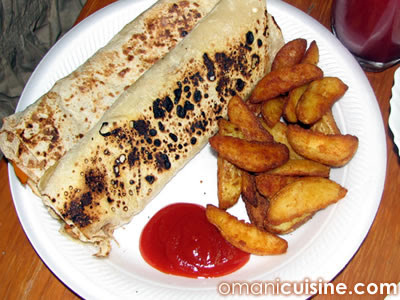 This post has been submitted by chef Mohammed Al Manthari – a Omani student in New Zealand. 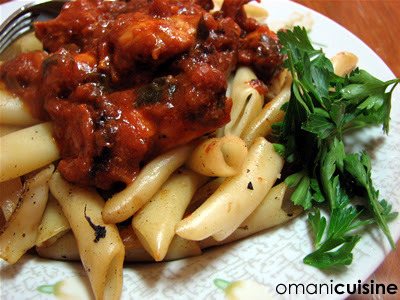 Please feel free to share your recipes and reviews with the rest of the Omani Cuisine community by emailing us at contact@omanicuisine.com. Today’s recipe is rich with protein and minerals and tastes great with its seasonal spices and basil leaves. 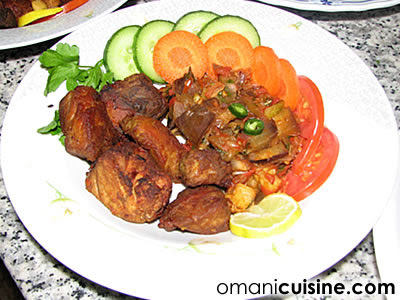 The locals of Oman are known for their many different fish dishes (Fish is the second largest export of the country after all!). I have chosen this recipe as it is one of the healthiest and most tasteful. A must-east for both grilled food fans and sea food fans! Â½ Kg of Tuna (Gaithar) Fish cubes. 2 crushed green chillies (amendable, 1 makes it mild). Before anything, marinate the fish cubes for an hour to 3 hours into bowel and add the green chillies, lemon, fish curry powder, salt, black pepper, turmeric, garlic and red chilli powder, then return the bowel in the fridge. Heat up the pot and add 2-teaspoon oil (preferably, olive oil). Add the onions and let it fry until golden brown. then add all the vegetables and add a cup of warm water. let it all cook for another 20-30 minutes on medium heat. heat the oven and add the fish pieces only to grill for 10-15 minutes, while the rest of the vegetables are cooking in lower heat. N.B: the spices are adjustable depending on your taste. Hope you enjoy your vegetable fish dish. 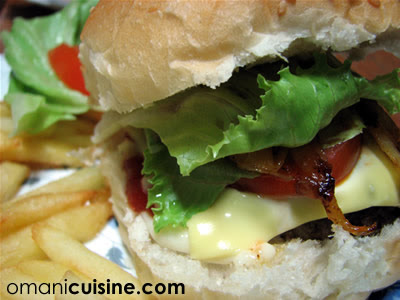 Prior to the launch of the Omani Cuisine, we attempted to make a burger from scratch, but the experiment failed miserably, we recently gave it another shot after doing some research and some unofficial experimentation at other venues, and as a result the Champions Burger was successfully born at the Omani Cuisine – coincidently AC Milan won the Champions League on the same day. mix the beef well with the coriander, shallots and the flour in a bowl. add the garlic, barbecue sauce, 1/2 a spoon of the Thai chili sauce, the Nandos crush, salt and pepper and mix with the beef. heat some EVOO in a frying pan until it is screaming hot. fry the burgers, each side left for six minutes. Extra – Spicy Cooked Onion to be served in the bun along with the burger. Leave the burger on the side and fry the onion in a pot with a little of EVOO, wait until it turns golden and then add the rest of the Thai chili sauce and some salt and pepper. Chop onion and capcicum into rings, crush garlic, and slice breast into long strips. 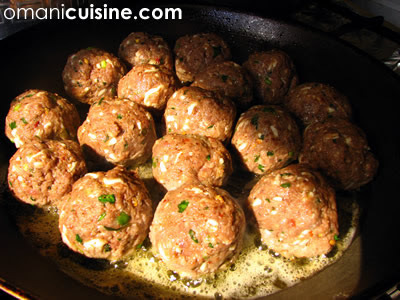 Heat the frying pan and add little of vegetable oil. When the oil is heated up put the onion and keep stirring until it gets golden. Add the chicken to the onion until it whitens. Then add(while stirring) the mixed arabian spices, salt, chili, pepper, and little of cinnamon. Add the vineger and the crushed garlic to the mix and keep stirring for two minutes. 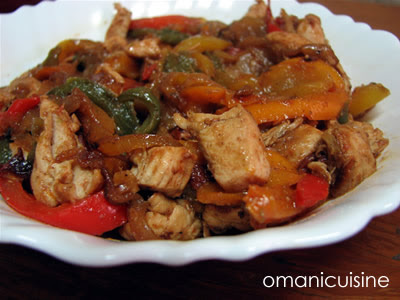 Add the chopped capsicum and the lime and stir until the chicken and the capcicum are properly cooked. Once ready, spread the bread and put the chicken in the middle then wrap it well. Get a clean frying pan and dry fry the wraps until they go browny and crispy. 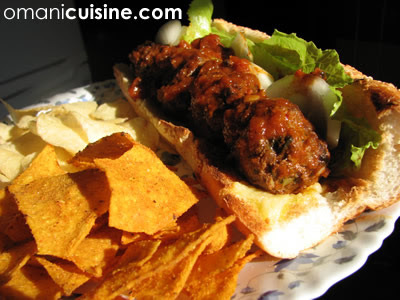 Serve with potato wedges or chips, and marina sauce.